Americans are far more likely to say there are strong conflicts between Democrats and Republicans in U.S. society today than to say the same thing about blacks and whites, the rich and the poor, and other social groups. An overwhelming majority (86%) of Americans say conflicts between Democrats and Republicans are either strong or very strong, according to a new Pew Research Center survey. By comparison, 65% of Americans see strong or very strong conflicts between blacks and whites, and 60% see them between the rich and the poor. The share of Americans who say there are very strong conflicts between Democrats and Republicans (64%) is more than twice as large as the share who see very strong conflicts between blacks and whites (27%), and between the rich and the poor (29%). Americans are considerably less likely to see strong conflicts between two other sets of people: those who live in cities and those who live in rural areas, and those who are young and those who are older. Among U.S. adults, 37% see strong or very strong conflicts between people in cities and people in rural areas; a similar share (35%) see strong or very strong conflicts between young and older people. Most Americans either don’t see conflicts between these two groups of people or say the conflicts are not very strong. While conflicts between Democrats and Republicans are perceived as strong by the vast majority of Americans, partisans generally agree on this point. Nine-in-ten Democrats and Democratic-leaning independents (90%) say there are strong or very strong partisan conflicts, as do roughly as many Republicans and Republican leaners (87%). Democrats are substantially more likely than Republicans to see strong conflicts between blacks and whites and between the rich and the poor. About three-quarters (74%) of Democrats and Democratic leaners see strong or very strong conflicts between blacks and whites, compared with slightly more than half (54%) of Republicans and Republican leaners. And while about seven-in-ten Democrats and Democratic leaners (69%) see strong or very strong conflicts between the rich and the poor, fewer than half of Republicans and GOP leaners (44%) agree. There are smaller gaps between Democrats and Republicans when it comes to whether there are strong conflicts between people in cities and those in rural areas (13-point gap) and young people and older people (7-point gap). There are also some notable differences in views by race and age. Blacks are more likely than whites to see strong or very strong conflicts between rich and poor, blacks and whites, urban and rural dwellers, and younger and older people. 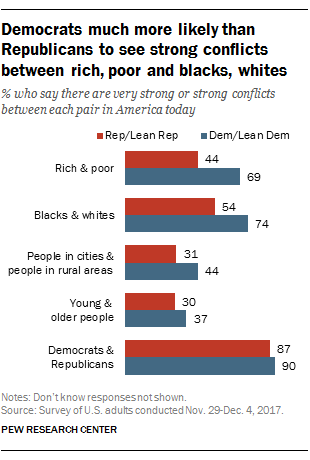 Whites, by contrast, are slightly more likely than blacks to perceive strong or very strong conflicts between the parties (89% of whites vs. 76% of blacks). Young adults also stand out on several questions. For example, nearly three-quarters (73%) of Americans under the age of 30 see strong or very strong conflicts between blacks and whites, compared with smaller shares of those in older age groups. And nearly half (46%) of those under 30 see strong or very strong conflicts between young and older people, compared with smaller shares among older Americans. 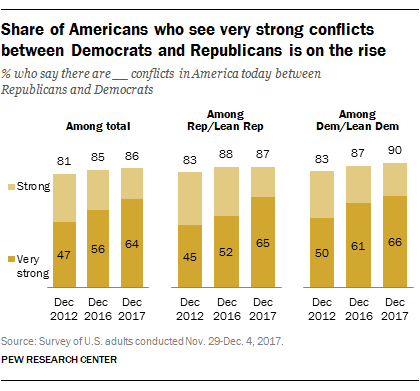 The nearly two-thirds of Americans who see very strong conflicts between Democrats and Republicans in the U.S. today is up from 56% who said this in December 2016 and 47% who said this in December 2012. These trends echo other research showing that the gap between Democrats and Republicans is, in fact, growing. The partisan gap on fundamental political values — including Americans’ views on government aid to the needy, racial discrimination and immigration — is now the widest in over 20 years of Pew Research Center surveys. On 10 questions that the Center has asked in surveys since 1994 through summer 2017, the average gap between Democrats and Republicans has risen from 15 percentage points to 36 points. This gap is now much wider than the average gap on the same questions between people of different races, ages, educational backgrounds and other demographic factors. The shares of Democrats and Republicans who have very unfavorable opinions of the other party are also much higher today than in the 1990s. In the yearly average for 2017, 44% of Democrats and Democratic leaners said they had a very unfavorable view of the GOP, while 45% of Republicans and Republican leaners said the same thing about the Democratic Party. While these shares are little changed in recent years, they have grown markedly over the long term: In 1994, fewer than 20% of people in both parties had a very unfavorable view of the opposing party.